The account’s bio described the account user as “Teacher & Advocate. Fighting for 2020.” The account user tweeted an average of 130 times each day to more than 40,000 followers. “Deliberate attempts to manipulate the public conversation on Twitter by using misleading account information is a violation of the Twitter Rules,” a Twitter spokesperson told CNN Business. More suspicious still was the fact that, according to information warfare researcher Molly McKew, a network of anonymous accounts was amplifying @2020fight’s post of the video across social media. 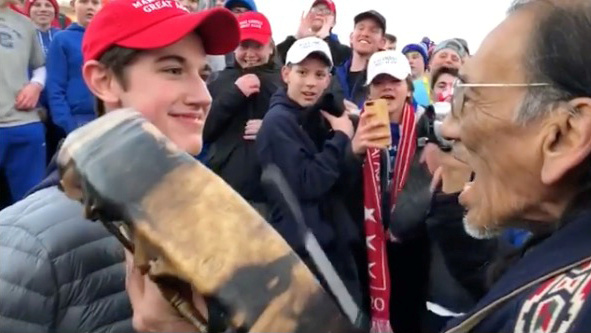 The account’s video did not show what preceded the encounter between Phillips and the students, and therefore did not reveal that a black supremacist group called the Black Hebrew Israelites initially accosted the students with profanity and racial slurs before Phillips and his colleagues also approached and confronted the high school students, who tried to drown out the two other groups’ insults with school cheers. Nevertheless, Twitter users retweeted @2020fight’s truncated video and its caption at least 14,400 times and viewed the video at least 2.5 million times. So influential was @2020fight’s post that members of the media reached out directly to the owner of the profile in the course of reporting on the incident. McDonagh said that @2020fight’s post was the primary version of events shared on social media. The post was so successful in helping to shape the narrative that scores of journalists, public officials, priests, bishops, nuns, dioceses, and even the students’ own school publicly denounced the children without reaching out to them for their version of events or waiting for further information about the incident. “This is the new landscape: where bad actors monitor us and appropriate content that fits their needs. They know how to get it where they need to go so it amplifies naturally. And at this point, we are all conditioned to react and engage or deny in specific ways. And we all did,” McKew said.